Croatia truly is a nation of beauty and history. 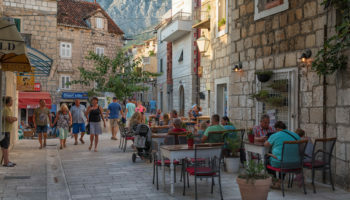 Bordered by Serbia, Montenegro, Slovenia, Bosnia and Herzegovina, Hungary and the Adriatic Sea, Croatia is in the middle of Southeast Europe and has a lot to offer travelers. 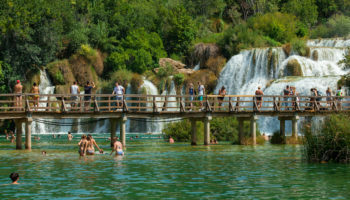 You can swim in the Adriatic, relax on stunning beaches or tour historic cities and Roman ruins. 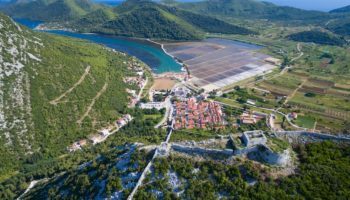 Whether you’re visiting for a few days or a few weeks, make the most of the adventure by selecting one of these amazing places to stay in Croatia. Head to an island off the coast of Croatia to appreciate the magnificent luxury of Hotel Bellevue Mali Losinj. Tucked into a secluded coastal inlet, this destination offers a level of privacy and exclusivity that definitely sets it apart. Completely refurbished in 2014, the Hotel Bellevue offers luxury suites with balconies and outdoor whirlpools, a private beach, an amazing spa and indoor as well as outdoor pools. Even with contemporary touches, however, it still boasts its striking and original mid-century modern architecture. The Hotel Odisej is like stepping back in time to a simpler way of life without losing any of the luxuries you might expect on a comfortable vacation. The hotel resort is built in the traditional style of Mljet island, including the distinctive red tiles on the roof. The location is unbeatable, offering access to the beach as well as a lush green atmosphere thanks to the surrounding Mljet National Park. Enjoy sea views as you dine on buffet meals, and spend a day at the nearby Sobra fishing village for a glimpse at authentic island life in Croatia. Overlooking the Adriatic from the western coast of Croatia is Opatija, a charming town that is also home to the Hotel Miramar. This villa hotel is incredibly historic, and the villa itself was constructed in 1876. The hotel is perched on a small cliff right over the water, and the popular Slatina Beach is less than a mile away. Just some of the featured amenities in this grand and impressive accommodation option include restaurant terraces, a freshwater indoor pool, a heated saltwater pool and an extensive sauna and fitness center. 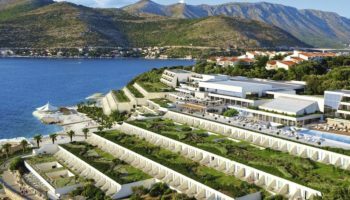 Hilton is a name that has come to mean upscale accommodation, and that is certainly proven true at the Hilton Imperial Dubrovnik. The exterior of the hotel is impressive, owing to a stately appearance created during its 1890s construction. 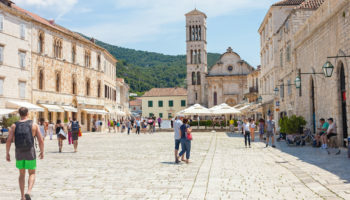 You can further embrace the history of Dubrovnik with ease since the hotel is just a short walk from places like the medieval Franciscan Monastery and the Pile Gate leading to Old Town. 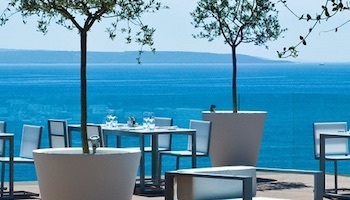 Foodies will love the elegant onsite dining and the terrace bar that serves traditional appetizers with a Croatian flair. For an upscale experience on the beach with plenty of contemporary appeal, don’t miss out on Hotel Lone Rovinj. Although this design hotel is just a short walk from the bustling and beautiful Mulini Beach, it is anything but a traditional coastal resort. Be prepared for floor-to-ceiling glass that reveals spectacular vistas, opulent rooms that contain features like private pools and separate living rooms, a highly-rated spa and trendy bars and restaurants that even travelers staying at other hotels come to experience for themselves. If you want to see the ancient city of Split and bring the rich culture of the destination to life, few places can compare to the history of the Palace Judita Heritage Hotel. The palace it is housed in was built in the 16th century, and the private inner courtyard, complete with an original well, still exists and is open to guests. If staying in a palace isn’t enough, this Croatian hotel is also a short walk from the incredible Diocletian’s Palace, arguably the most important landmark in all of Split. 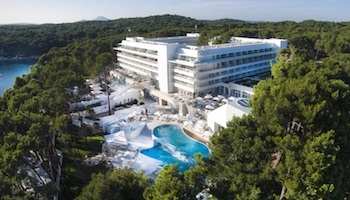 In Hvar Town, on the Croatian island of Hvar, is the spectacular Hotel Adriana. 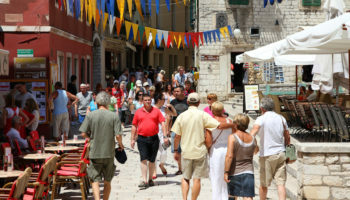 The location of the hotel is ideal, putting you steps from the Hvar Marina as well as the Hvar Cathedral. Although it is surrounded by lots to see and do, you might be tempted to spend all your time at the hotel. The property boasts a waterfront restaurant, a fantastic spa, garden terraces, a beach club and a rooftop saltwater pool. The rooftop bar is the best place to be at sunset each evening and enjoy spectacular views of the ancient town, bay, and Paklinski Islands. In the heart of Zagreb, the country’s largest city and its capital, is the Esplanade Zagreb. Housed in a spectacular art nouveau building from the 1920s, the hotel embraces the era of art deco and all its luxury. Rooms in the hotel boast marble bathrooms and stunning city views, and guests have access to four fantastic restaurants in the hotel as well as an extensive fitness room and sauna space. For the best views of the exterior, stroll outside at night and revel in the illuminated facade of this architectural masterpiece. Off the coast of Poreč, Croatia, is a small island dotted with a handful of bungalows and buildings that are all part of the Valamar Isabella Island Resort. The main building on this private island is the Valamar Isabella Hotel. Accessible only by a shuttle boat, the resort is incredibly private, letting you get away from the hustle and bustle of everyday life. The rooms flat-screen televisions and sea views are appealing, but the best of the hotel is found outside. You’ll love the chance to go boating, swimming or just sightseeing on the secluded beaches and pristine pools of this resort island. Just south of Dubrovnik is Cavtat, a coastal destination that offers lush greenery as well as blue waters and pristine white sand. There, you’ll find the Hotel Croatia Cavtat nestled on a cliff, an upscale resort where rooms often include private balconies overlooking the Adriatic Sea. Although you might be tempted to spend all of your time at one of the two private beaches, the hotel also boasts world-class amenities like indoor and outdoor pools, five spectacular restaurants, a piano bar, a Finnish sauna and a spa. 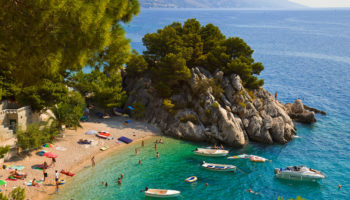 Dubrovnik is known as the Pearl of the Adriatic, and the Hotel Villa Dubrovnik may just be the jewel of that coastal city. The hotel itself is built right on the cliffs of Dubrovnik, which means that guests get to enjoy views over the Adriatic Sea and the Isle of Korum. Although the location is steeped in history, and you’ll be just minutes from the 15th century palace called Knežev dvor, the design and furnishings of the hotel are luxurious and modern.